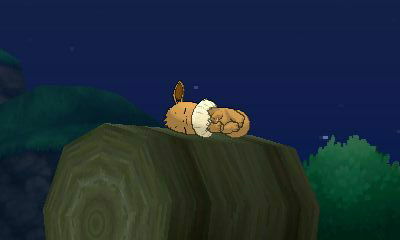 Discussion in 'POTW Collaboration' started by Serebii, Apr 7, 2019. Although a tad on the fast side, Crawdaunt can still work in Trick Room. A Focus Sash can be used with Swords Dance to boost and compensate for any kind of Intimidate drops you may encounter, while a Life Orb is more suited for use with Protect as setting up without Sash isn't that easy due to its awful special bulk. Adaptability-boosted hits, potentially with a Swords Dance behind them, will hurt a lot, and combined with something like Oranguru to Instruct it for more attacks can be devastating (especially if you have other attackers like Marowak coming in later to clean up). Crabhammer vs Liquidation is accuracy vs power. Crabhammer also crits a bit more often, while Liquidation can lower defence. The thing about lowering defence though is that Crawdaunt already hits so hard that if an enemy actually survives the hit it will usually already be in deep yellow if not red health bar, making the defence drop kind of meaningless (while a crit in such a case would assist for the KO). Knock Off vs Crunch is utility of removing items vs consistent power. Aqua Jet is priority and can be used to eliminate slower foes like Alolan Marowak. At +2, Crabhammer can OHKO a ton of foes like Mega Kangaskhan and Garchomp. Crunch and Knock Off both easily OHKO Mega Metagross, as does Crabhammer. Knock Off at +2 can OHKO Ferrothorn if it still has an item to be knocked off (although Ferrothorn can OHKO back with Power Whip and outslows). Crunch and Knock Off can both OHKO Amoonguss at +2. Overall, I think it can work. It's awfully frail on the special side and a bit vulnerable to priority and there are probably better Trick Room attackers out there (like Alolan Marowak), but Adaptability + Swords Dance + 120 base attack does hit tremendously hard and Crawdaunt does have sufficiently powerful physical STAB moves to take advantage of it. Just keep it away from the likes of Kommo-o, Tapu Fini, and Tapu Bulu as they walk all over it. Especially Kommo-o has solid physical bulk, resists Crawdaunt's STAB, and doesn't mind Knock Off either thanks to running a Z-crystal. Crawdaunt, the signature Pokemon of Tierno. Do not bring a Houndoom to a Crawdaunt fight. 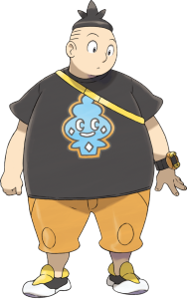 Background Information - Tierno's Signature Pokemon Crawdaunt. Makes a lot of sense actually. Crawdaunt is a Gen 3 favorite but to the surprise of some, Crawdaunt didn't become someone's signature Pokemon until Gen 6 on the team of Tierno, the rap-dancing rival which kind of makes sense considering it's pre-evolution Corphish was always portrayed as a bit hyper around Ash. In fact it was the anime that arguably helped popularized Crawdaunt through this Corphish as it's hyper personality always made it stood out. 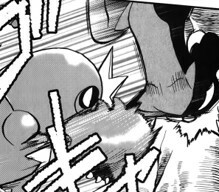 Crawdaunt's other known appearances outside of the anime is in Pokemon Adventures XY where it debuts, you guessed it, as Tierno's signature Pokemon at the right time to give an absolute knock-out to an aggressive Houndoom. Other than that, Crawdaunt is an absolute favorite of mine and it's a bit of a shame that he isn't as used as much these days. Well-Known Trainers who caught or befriended the Crawdaunt line. Another reason why I say it makes sense that Crawdaunt is Tierno's Pokemon is that Crawdaunt has access to the dancing moves, Dragon Dance and Swords Dance, befitting of an aspiring rap-dancers signature Pokemon and honestly from there, just take your pick. Both are pretty good but it really depends on where your priorities lie. For me personally, I freaking love Dragon Dance and it works well with even an Adamant Nature, giving good coverage to all his moves but for some Swords Dance is a priority due to prioritizing Aqua Jet into a potentially one-shot move thanks to the rare and amazing ability Adaptability. It has been a long and rough road for Crawdaunt. Have dual special STABs while being a physical sweeper in its debut generation (heck it didn't even get a good Dark STAB in its debut games), the years have been kind to Crawdaunt. The physical special split in Gen IV gave it viable STABs working off of its impressive base ATK, HGSS gave it an excellent boosting move in Dragon Dance, Gen V gave Crawdaunt an amazing hidden ability in Adaptability boosting its STABs to utterly terrifying levels. Gen VI buffed Knock Off giving Crawdaunt a STAB move that will tear through anything short of a dedicated wall or resist. Now it is Gen VII and while the changes for Crawdaunt have been minor, the metagame is a different matter entirely. New fairies altering the landscape around them, everything holding one time nukes... Crawdaunt's fraility has never been more exposed. However, Crawdaunt is still packing plenty of power that allows it to muscle past/maim anything that is set before it. ...with a side of Punch! Choice Band Crawdaunt has instant impact considering how difficult it can be for Crawdaunt to setup, this can be a life saver. The extra coverage doesn't hurt either. Crabhammer and Knock Off are the STABs of choice, doing disgusting damage to everything that doesn't resist them. Aqua Jet is powerful, painful priority that patches up Crawdaunt's speed issues. Last move is down to preference. Superpower is often preferred, hitting Dark types like Hydreigon and other threats such as Kartana and Ferrothorn for massive damage (Giant Enemy Crab says HAH! ), while X-Scissor hits a good number of Dark and Grass types without the drawbacks of Superpower. -Rock Slide -offers additional coverage against flying and bug types, but most are wrecked just as badly by Crawdaunt's STABs. -Switcheroo -Crawdaunt isn't the bulkiest of pokémon, but pulling a Switcheroo-Choice Band can disable a Pokémon for the rest of the match. Short story: Banded Crawdaunt is very difficult to properly wall. While Crawdaunt will hate getting hit by any of these pokémon, catching them on the switch will comprise the integrity of nearly all of these pokémon. Popular physical walls like Gliscor, Hippowodon, Landorous-T all can't face Crawdaunt without being slaughtered by its STABs. 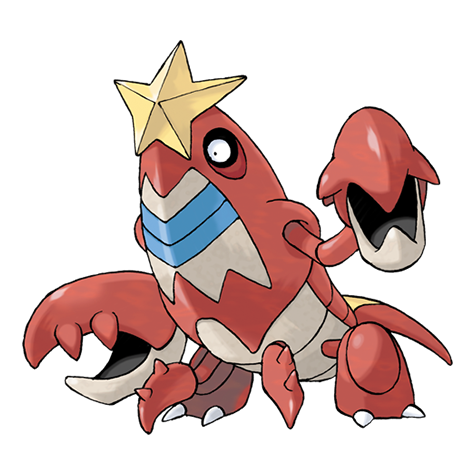 Crawdaunt is really only usable in Trick Room, since it is outclassed as a physical Water-Dark type by Sharpedo. Sharpedo has higher HP, Speed and Special Attack than Crawdaunt, while also having higher Special Defense in its Mega Form. Out of its 3 abilities, Shell Armor is the worst among them. While Hyper Cutter may seem to be situational at first, is actually quite useful since Intimidate is so common. Real talk, the only ability you want to use on Crawdaunt is Adaptability. It's just such an absurdly good ability that always gives you a boost to your STAB, so you get a great effect with literally no situational factors involved. Using a Crawdaunt without Adaptability is seriously gimping it, Hyper Cutter isn't even remotely comparable. I think Body Slam deserves a mention, since it has a pretty decent chance to paralyze the foe, even though it can't be super effective. I don't think Crawdaunt really has the bulk to sit around for a couple of turns hoping for a paralysis roll. Crawdaunt needs to hit as hard as possible to get KOs, and Body Slam gets no Adaptability boost and no super effective boost either. Resisted Crabhammer hits harder. And even if you do get lucky and land the paralysis you still need to be lucky again to have it actually pay off and prevent them from using their move.